Hey everybody! I’m Steve, Creative Director over at Pixel Maniacs. As some of you may remember, we released our puzzle shooter ChromaGun on PS4 in August 2017. A bunch of you mentioned you’d love to see the game on PS VR. At that point, we hadn’t planned on making a VR version of the game at all. But I, in my charming naiveté, told you we’d do it, if you spammed our inbox with requests. Well, you did. And thus began our undying love for the PS VR community, as you, and the lovely gamers over at r/PSVR began showering us with emails about bringing the game to your HMD. It’s been quite a ride, but I’m unbelievably happy to announce that ChromaGun VR will be dropping exclusively for PS VR on February 19. This concludes the TL;DR section of the PS Blog post. What follows, is a rendition of the pains and joys we went through to make this happen. Note that this may get a bit technical. You’ll probably know that VR demands far more performance from a gaming system than a regular, flat game. This is because everything needs to be rendered twice, once for each eye (which is why there’s no VR for spiders). Additionally, VR games need to achieve consistent, high frame rates, to maximize immersion and minimise the risk of motion sickness. Now, ChromaGun was our debut title, and we had not a clue in the world, what we were doing when we started developing it. Without going into too much detail, just imagine the game’s code as a big messy ball of spaghetti. We did get it running smoothly at 60 FPS on PS4, but just barely. On PSVR, we had to do everything twice as fast. If that doesn’t sound hard enough to you, try eating heaps of spaghetti until you’re full, and then eat the same amount of spaghetti again. * It’s like that. But less delicious. *Please don’t actually do that, it’s a metaphor. To get the performance we needed, we switched to baked lighting. The flat version uses dynamic lights and semi-realtime global illumination (basically simulating light bouncing off surfaces). This looks good, and allowed us to change lights while the game is running, but it’s also very performance hungry. So instead, we’re now completely pre-computing all lights. It’s not dynamic, but it’s a lot cheaper, which is what we’re looking for in VR. And with the right settings, it can look just as good. 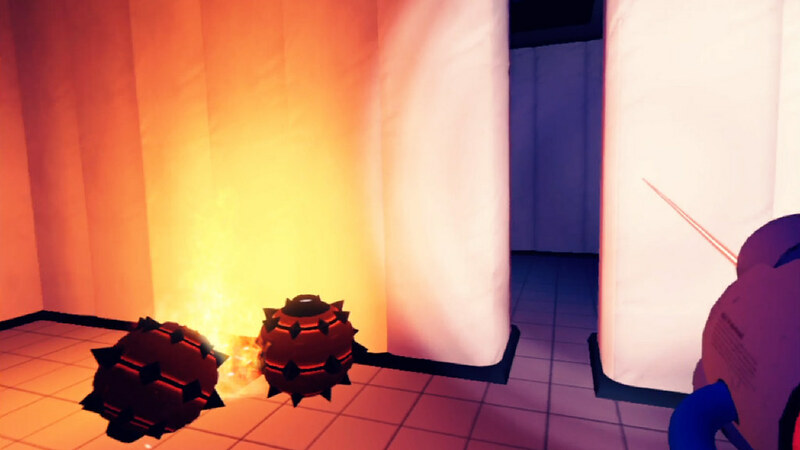 There’s obstacles in the game, called Color-Defiant Particle Meshes, that block the droids’ attraction to colored walls, but still allow the player to shoot through them. In the flat version, these are ceiling-high transparent walls – a huge hit on performance. So instead, in ChromaGun VR, they’re now knee-high barriers, that behave in the exact same way. They just look different. There are a few more things we did to enhance the effect of VR. For one, the main menu is now an entire room you can walk around, including the lamest movie theater ever, that only ever plays the credits of the game. To further enhance the depth effect, we added tiny dust particles that float around the air. They don’t change anything (and you might not even notice them), but VR feels a lot more immersive with such details. While we did resize some of the chambers to improve performance, and make gameplay more snappy in VR, we chose not to change the overall gameplay. There are no new chambers in ChromaGun VR. This was a touchy decision to make, because a lot of levels follow a curve, forcing players to turn around. Had we designed new levels for VR, we could’ve made them lead straight ahead, making it more comfortable to play. But in the end, we wanted players to be able to experience the original ChromaGun in VR, not some watered-down port of the game. 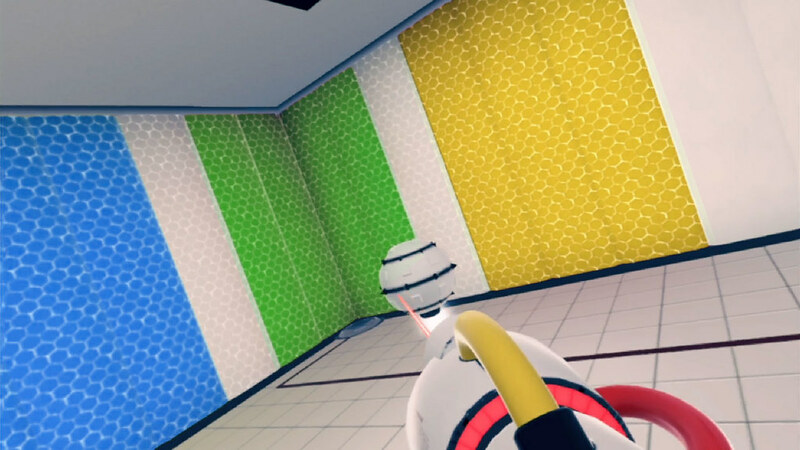 What we really love about ChromaGun VR is working with the Aim Controller — there’s just something magic about that thing. Strapping on the headset, and then actually picking up the ChromaGun, is just something else. We put great detail into perfectly aligning the 3D model of the ChromaGun with the actual Aim Controller, to make sure it feels just right. There’s a bunch more we did to bring ChromaGun to PSVR, but this should give you a glimpse of what we’ve been doing for the past year and a half. 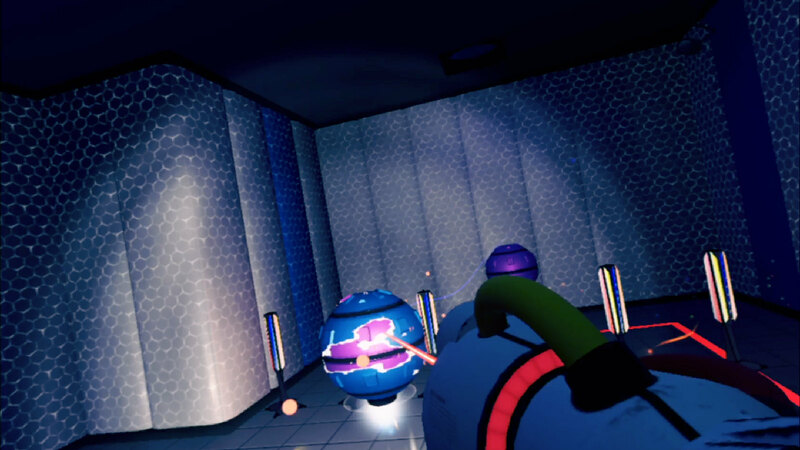 If you’ve read until this point, you’re pretty familiar with the story of ChromaGun VR, and you’ll be able to appreciate my friend Andi, who was the sole programmer on the PSVR port and is responsible for the game happening. Thank you, Andi. You beast. Now, it’s time to wrap this up. We really hope you’ll enjoy ChromaGun VR. If you have any questions, feel free to ask!